As all readers of American Wasteland are aware, the introduction to Jonathan Bloom’s book begins with a picture of an orange in a North Carolina parking lot – which Jonathan later eats and finds that it is fine (as he points out, “that’s why oranges have skin”). I had a similar experience last week while heading to my innovation for sustainability class at the University of Pennsylvania, which this term is focused on the serious problem of global food waste. While emerging from my car in the parking garage (and simultaneously engaged in a conversation about food waste), I spotted this orange on top of a garbage can just outside of the elevator. 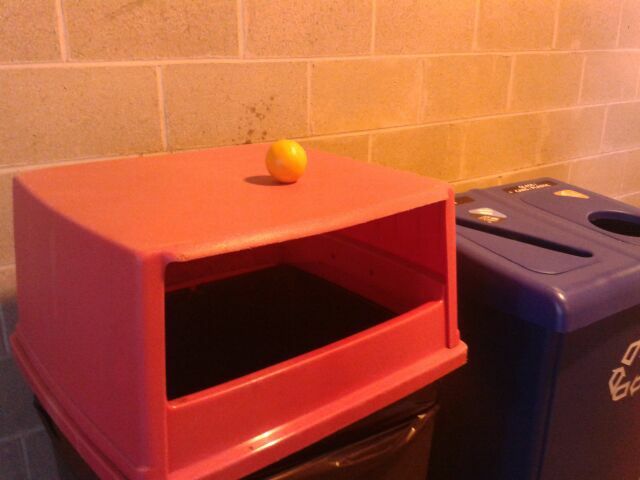 I can only guess that the owner felt guilty about discarding a perfectly good orange, and chose to leave it on the top of the trash can with the hope that someone else would pick it up. I decided to conduct an experiment, and left the orange on the container. It was still there hours later as I re-entered the parking lot to drive home that night. The next day I returned, parked in the same spot, and didn’t see the orange on top of the bin as I emerged from my car. Unfortunately, I found that someone had simply picked it up and tossed it in the bin, where it was sitting amidst the other garbage collected during that week. I had been hoping someone would have followed Jonathan’s action, but it was not to be. A small example of the ease with which we discard perfectly edible food that could be redistributed elsewhere.